After replacing Julio Velazquez with Davide Nicola, Udinese will try to turn their fortunes around against an-injury hit Roma side on Saturday. The ex-Crotone tactician will have the tough task of revitalising the Zebrette, as the Friuliani have just one point from the last seven rounds and conceded an average of two goals per game. This resulted in joint 17th spot in the table with just nine points, as many as Serie A newcomers Empoli, practically in the relegation zone. Udinese’s 2-1 defeat against Empoli two weeks ago summed up most of the issues in the team’s play under Velazquez, as the Friuliani were wasteful in front of goal, lost concentration regularly in defence and were very predictable in the attacking third. Rodrigo De Paul missed a penalty against Empoli, but he’ll need to step up if the hosts are about to cause an upset against Roma, as the Argentinian is the man who can cause havoc in the Giallorossi’s shaky backline. Roma have conceded a goal in each of their last four Serie A games and considering that Kostas Manolas, Alessandro Florenzi and Aleksandar Kolarov are all in doubt for their visit to the Dacia Arena, Udinese would fancy their chances of scoring at least once past Robin Olsen. Daniele De Rossi is an injury doubt as well, which means that Bryan Cristante and Steven Nzonzi will anchor Roma’s midfield in the absence of their captain. Cristante has had a hard time adapting to Eusebio Di Francesco’s style, but the Milan youth product has improved significantly in recent weeks and was excellent in the 4-1 victory against Sampdoria. The Nzonzi-Cristante duo will try to match the physicality of the hosts, as Udinese often aim to out-muscle opponents, which turns many of their games into a real battle. It will be interesting to see if Nicola would go for a drastic change in Udinese’s gameplay in his debut at the helm of the club or if the tactician will stick to his team’s strengths, which haven’t been able to provide the goods under Velazquez. Roma are currently sixth in the standings and will be desperate to get a win and finally find some consistency after beating Sampdoria. The visitors will try to dominate possession and put pressure on the hostsright from the start. However, the enthusiasm that a new manager always brings in, as well as Udinese’sunorthodox style, might not allow them to do that, which could put pressure on Roma’s injury-hit backline. The Giallorossi also have a mouth-watering Champions League clash with Real Madrid on Tuesday, so Di Francesco would probably not risk some of his key players against Udinese. Javier Pastore, Lorenzo Pellegrini and Diego Perotti are also doubts for Roma, so Nicolò Zaniolo might get another start in the trequartista role behind Edin Dzeko or Patrik Schick. Udinese have some injury issues on their own, as Lukasz Teodorczyk and Emmanuel Agyemang-Badu are injured, while Antonin Barak is also a doubt. Roma have won all of their last 10 Serie A games against Udinese. The last time the Zebrette defeated the Giallorossi was in 2011, when two late goals by Antonio Di Natale and Mauricio Isla secured a 2-0 victory for the Friuliani. Juventus have been nigh-on unstoppable in Serie A this season and host a SPAL side seeking an upset. If you were to make the argument that Juventus couldn’t have wished for a better fixture to return to from the international break, I doubt there would be many out there who’d disagree with you. Now, I’m not saying for one second that SPAL will be an easy game for Juventus, because not only would that be incredibly disrespectful towards Leonardo Semplici and his side, but it just isn’t true. SPAL have the talent and ability to cause an upset, just like they did away at Roma earlier in the season, but Juve are a different animal this year. With the exception of one draw at home against Genoa, the Old Lady have been lights out in Serie A, winning 11 of their opening 12 fixtures and building a chasm between themselves and the chasing pack. While SPAL will be looking to upset the hosts this Saturday, they face a Juve team that looks hungrier, more determined and more ruthless than before. 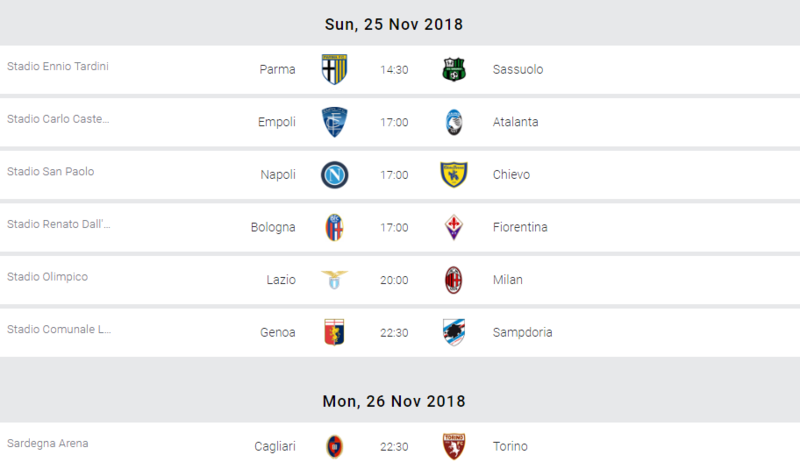 Besides the loss against Manchester United in the Champions League and the aforementioned draw against Genoa, Juve have lived up to exception massively and their already large six-point gap over Napoli looks like it can only be stretched further, but to be the dominant force that is expected of them, they need to dispatch sides like SPAL with ruthlessness, building up as much of a ‘force of nature’ feel around their team not only in Italy, but across Europe too. Juve have shown a tendency to be complacent and sit on a one-goal lead, which is what came back to bite them against Genoa and Manchester United. There is always the risk after Milan and ahead of the Champions League that SPAL won’t entirely motivate them to raise their game. But let’s not forget SPAL in all of this, who of course have their own objectives to work towards in this game. If anything, they will use the Manchester United and Genoa matches in Turin as a cause for optimism, in the sense that even if you aren’t at your best and may not be the strongest of sides on paper in comparison to Juve, you always have a good chance of a result if you take the chances you create. SPAL currently sit in 15th place in the Serie A table, just four points off of Empoli in the relegation zone. They managed to stop their losing run prior to the international break with a point at home against Cagliari, but after the tremendous start that SPAL had, the run of just two wins in 10 games is poor form for anyone and it won’t be any easier this weekend. That being said, you just never know what can happen and maybe the visitors will take notes from how they won in Rome back in October, setting up in a similar fashion this coming Saturday. Juventus to keep a clean sheet, as a fourth straight home Serie A game conceding would be their worst streak since October 2015. Inter have to refocus after the 4-1 mauling by Atalanta, but also gear up towards a Tottenham showdown as they host revitalised Frosinone. Every cloud has its silver linings, or so the saying goes. Luciano Spalletti’s Inter headed into the international break off the back of a 4-1 loss against Gian Piero Gasperini’s Atalanta. It came as quite a surprise, considering the Nerazzurri were on a seven-game winning streak. The silver lining is that this loss couldn’t have come at a better time. With Spalletti able to leave his squad with the constructive message of ‘We’re not as good as we think we are, yet’ as they jetted off for internationals. So there’s arguably no better type of game for Inter to bounce back than a home match against a relegation candidate. Moreno Longo’s Frosinone currently languish in penultimate place, with just winless Chievo separating them from the bottom spot. In fairness to the Serie A new boys, they’ve begun to find their feet in recent weeks, picking up one win and three draws in their last four games, as opposed to one draw and seven losses in eight rounds prior. The game is arguably well set up for both sides. Spalletti’s men have the fourth best home record in Serie A with 13 points from six games. Frosninone on the other hand have surprisingly picked up more than half their points on the road with four from six and rank 15th for points won in away games. There’s no prizes for figuring out how this one is going to go. Even without their midfield maestro Marcelo Brozovic, Inter will still look to control and execute their game plan through the more than adequate replacement of Borja Valero. There’s a few key attacking changes planned for Inter but considering they’re up against the third worst defence in the league, this could be about damage control. In terms of team news, Brozovic will miss out due to a red card picked up against Atalanta. Spalletti clearly seems to be looking ahead to the Champions League game against Tottenham Hotspur, with regular starters Kwadwo Asamoah, Radja Nainggolan, Mauro Icardi and Matteo Politano all set to be rested. Sime Vrsaljko is out after picking up an injury on international duty. Frosinone enter this one with a relatively clean bill of health aside from midfielder Emil Halfredsson and Cristian Molinaro, who are doubts for the game via injury. These sides met only once, in the 2015-16 Serie A season, Inter winning 4-0 at home and 1-0 away. Parma seem to be finding their form again, while Sassuolo are unbeaten in four and only two points separate them. The hosts head into this match having won their last game against Torino by two goals to one, while the visitors are coming off of a 1-1 draw with Lazio. Both teams are doing well in the league, with Sassuolo in seventh and Parma in 11th, but there are only two points between them. A win or draw, depending on the results of other matches, for Parma could see them in the top half of the table for the first time since the 2013-14 Serie A season. For this to happen, Roberto D’Aversa’s squad need to ensure they’ve found their scoring touch. Prior to Parma’s trip to Torino, the Crociati went three games without scoring a single goal. This drought saw Parma drop seven points towards the end of October and beginning of November. However, D’Aversa coached his side to a massive away win against Toro to steady the ship. Goals from Gervinho and Roberto Inglese, who are the team’s leading goalscorers (Gervinho with four and Inglese three), saw their side come away with all three points and in a good position to break into the top 10. The only notable injuries for Parma include veteran midfielder Massimo Gobbi and 29-year-old striker Antonio Di Gaudio. Sassuolo will make the hour-long trek to the Stadio Ennio Tardini looking to continue the impressive season they’ve had thus far. Despite a run of three games without a win in October, I Neroverdi currently sit in 7th place in Serie A. A win this Sunday could see them move into the top five along the likes of Napoli, Juventus, and Inter. Roberto De Zerbi has multiple scoring options at his disposal to help power his side to a victory. Along the frontline, five separate players have a goal to their name, add on to that Kevin Prince Boateng and the league’s joint-highest scoring defender Gian Marco Ferrari, you have a side that can score in multiple ways. Jeremie Boga and Claud Adjapong are out of action for some time. There have been 18 goals in the last five meetings between these sides. Fiorentina will be looking to fire themselves straight back into Europa League contention when they travel to struggling Bologna. Last week, the Rossoblu handed Giampiero Ventura his first – and only – point on the Chievo bench after Riccardo Orsolini rescued a 2-2 draw. Despite this point, they are winless in their previous five Serie A matches, which highlights how huge the three points on offer for Pippo Inzaghi are. Bologna currently sit 16th and just one point clear of the relegation zone. Fellow relegation candidates Udinese host an injury-hit Roma on Saturday in a game that the Giallorossi could very well drop points in. Inzaghi will enter this match with no injuries or suspensions, meaning that he will have a full squad to choose from. Meanwhile, Fiorentina were denied by an Andrea Pinamonti strike before the break and were held to a 1-1 away draw to Frosinone. La Viola started off the season relatively well, however like their opponents are winless since September 30, a 2-0 home victory over Atalanta. They are on the back of an astonishing four consecutive 1-1 draws, as the attack earlier touted as one of the competition’s most potent seems to have hit a roadblock. Stefano Pioli will be demanding his players rediscover their form. A win in this match could see them jump up to sixth place, depending on other results. German Pezzella is the only absentee for Fiorentina, as the Argentine defender battles a thigh injury. This is sure to be an intriguing match-up for the neutral fan. Both sides desperately need the three points to enforce their respective positions in the standings. Fiorentina are unbeaten in their last eight Serie A games against Bologna, with just a single 1-1 draw since their 2-1 loss here in February 2013. Atalanta are on spectacular form with four consecutive victories, but visit an Empoli side rejuvenated under their new Coach. A run of four straight wins and 14 goals in the last five matches moved Atalanta back into Europa League contention. Their 4-1 mauling of Inter before the international break has been the highlight of their campaign so far. Gian Piero Gasperini’s side are in tip top shape after a dismal start, finally shaking off the trauma of their Europa League play-off exit to FC Copenhagen. Empoli’s 2-1 victory over Udinese was their first win since the opening weekend and a great way for Coach Giuseppe Iachini to make his debut after replacing sacked Aurelio Andreazzoli. After seven defeats and two draws, the club decided that beautiful football and compliments weren’t enough to ensure survival, so axed Andreazzoli for someone more practical. Francesco Caputo increased his goal tally to six against Udinese and will be hoping to help his team to another victory on Sunday, but Atalanta aim to exploit Empoli’s defensive deficiencies, as the home side have conceded 12 goals in their last five games. It is absolutely no coincidence that Atalanta found their form with the return to fitness of Josip Ilicic, who spent much of the summer battling a viral infection. The Slovenian scored three goals this season, while Alejandro ‘Papu’ Gomez also finally got back on the scoresheet against Inter. Empoli will be without defender Lorenzo Polvani and forward Alejandro Rodriguez, who are both long-term absentees. Atalanta will also be missing wing-back Arkadiusz Reca and defender Marco Varnier, but crucially have Andrea Masiello back after a month out. Jose Luis Palomino remains in doubt. Josip Ilicic has contributed to six goals in his last six Serie A games, scoring three and assisting three. The Slovenian has a great record at the Castellani, bagging two braces here in three visits. Napoli moved clear in second place and return from the break for international duty against a Chievo side on their third Coach of the season. The Partenopei fought back under a thunderstorm to defeat Genoa and take advantage of Inter’s surprise 4-1 defeat to Atalanta by creating a three-point cushion in second. Carlo Ancelotti’s men will be widely expected to take the victory here with ease, but that’s precisely the kind of situation where Napoli have traditionally struggled. The fact this game is played after the break for international duty and ahead of a Champions League crunch match only adds to the risk of complacency. Chievo are rock bottom and their crisis shows no signs of calming down. Lorenzo D’Anna was sacked after two points from eight rounds, then his replacement Giampiero Ventura sensationally quit after a draw against Bologna, his only positive result in four disastrous rounds. Bitterly criticised by the club and their historic captain Sergio Pellissier, Ventura gave off the impression of abandoning a sinking ship, one that started the season with a three-point penalty due to financial irregularities. Domenico Di Carlo is at least familiar with the Stadio Bentegodi, as this is his third stint at Chievo and he twice before saved them from relegation. Manuel Pucciarelli, Emanuele Giaccherini, Pawel Jaroszynski, Nenad Tomovic and Nicola Rigoni are all on the treatment table for the visitors. Napoli miss Simone Verdi, Sebastiano Luperto, Vlad Chiriches and Alex Meret, although Amin Younes could get his first call-up of the campaign. Arkadiusz Milik is the favourite to start in attack, perhaps because Dries Mertens has never scored against Chievo in eight previous attempts. They are the only club he faced at least four times in Serie A and didn’t score past. Chievo have beaten Napoli only once, in September 2014, in their last 10 Serie A meetings, managing two draws and seven defeats, home and away. Lazio and Milan face off for fourth spot and that all-important Champions League spot, but there’s a massive injury crisis. The Biancocelesti have had mixed results in recent weeks and will have perhaps welcomed the international break. A home tie against a depleted Milan provides Simone Inzaghi’s team the perfect opportunity to return to winning ways in the league, whilst also creating a small gap between them and their Milanese rivals. Aquile have won four of their six home matches so far and have only lost this fixture once in the last five seasons. Lazio welcome back Milan Badelj and Felipe Caicedo, but Lucas Leiva remains in doubt with a muscular issue. Luis Alberto has so far failed to repeat his sensational form from last campaign and is in serious need of a confidence-boosting performance. He faces competition for his place from both Caicedo and Joaquin Correa. The football Gods appear to be working against Milan boss Gennaro Gattuso, as a list of key players have been side-lined with injuries. Captain Alessio Romagnoli and fellow defender Mateo Musacchio are out for a month, with Mattia Caldara, Giacomo Bonaventura and ex-Lazio midfielder Lucas Leiva hobbled for significantly longer. Gattuso is hoping to have energetic defender Davide Calabria and creative attacker Hakan Calhanoglu available for selection. Gonzalo Higuain’s meltdown in the loss against Juventus means he is suspended at a time when his team are in urgent need of his quality. Currently sitting in fifth place and just a point off their hosts, the last couple of weeks have been far from ideal preparation for the Rossoneri. This crucial away trip against a direct rival, together with their injury crisis, will be a stern test of Milan’s mentality and resolve. The Diavolo are carrying an unwanted record against the current top four, having won only once in their last 16 outings against those above them. However, that win did come against Lazio and although three points looks unlikely, any positive result would be seen as an achievement in the current circumstances. Milan have earned six points during the last 10 minutes of play this campaign, more than any other side. Lazio on the other hand are yet to drop any points in same period. The last six leagues meetings at the Stadio Olimpico have seen both teams find the net, with a total of 22 goals, an average of over three per game. The Derby della Lanterna is always a tense affair, but this time Genoa could fire their Coach and Sampdoria are in bad shape too. Il Grifone are in 14th place and winless in their last six Serie A games. Their last outing was a 2-1 defeat to Napoli in the Stadio Luigi Ferraris just before the international break. The Rossoblu did take the lead in that game and were good value for their goal advantage until a deluge poured down from the heavens and halted proceedings, giving the Azzurri the opportunity to turn the tie around after the restart. Coach Ivan Juric is under immense pressure to get something out of this edition of the derby after three defeats in a row, which saw his side concede nine goals while scoring just twice. A 5-0 thumping by Inter in their last away game followed a narrow 2-1 loss to Milan, where Alessio Romagnoli’s last minute winner stole the three points for the Rossoneri. Juric has a massive dilemma on his hands, as his main attacking threat Krzysztof Piatek has yet to score since the Coach replaced Davide Ballardini. The Pole scored nine times in his first seven matches, but looks like a different player under his new boss. Juric will have to do without the services of goalkeeper Federico Marchetti, who has yet to feature this season, while Brazilian midfielder Sandro faces a race to be fit in time for this one. The home side have won just once in their last nine derby matches, which was a 3-0 result in 2016. The Blucerchiati meanwhile have just one more point than their city rivals and are sitting in 12th position. A run of losses on the bounce saw them plummet down the table, with just two wins in their last nine games putting pressure on boss Marco Giampaolo. Giampaolo’s men lost two of those games by a 4-1 scoreline, at home to Torino and away to Roma, making it 11 goals conceded in the last three rounds. Work will have to be done on that porous defence and Giampaolo will have a few selection headaches ahead of this huge derby game. He’ll have to do without Polish midfielder Karol Linetty, who is suspended, while Vasco Regini is a long-term injury absentee and Paraguayan Edgar Barreto is out for a couple more weeks yet. Expect this match to have the full pageantry and passion that a derby of such magnitude deserves. Whether the quality on the field matches the fervour of the fans in the stands is another thing. Perhaps with both Coaches’ heads close to the chopping block, some leaky defences and a bunch of capable but misfiring attackers on the pitch, we could be in for a wide-open affair. Genoa have lost each of the last five ‘home’ editions of the derby, failing to score in four of them. Sampdoria kept three consecutive Serie A clean sheets against the Grifone, home and away. After a surprise loss heading into the international break, Torino will hope that the hiatus will have done them some good as they visit Cagliari on Monday evening. The Granata had built up a four-game unbeaten streak, including an impressive 4-1 win against Sampdoria at their opponents’ home ground prior to welcoming Parma to the Stadio Olimpico earlier this month. However, they saw this run come to an abrupt end, as Walter Mazzarri’s side became the latest to suffer an unexpected home loss against the Crociati, who are back in the top flight for the first time in several seasons. A 2-0 deficit incurred inside the first 30 minutes proved to be too much for Torino to overcome, despite pulling a goal back, and as a result, they went into the international pause sitting in tenth spot. That being said, given how congested things are in the middle of the table, a win could see a team jump up a couple of places into the European berths, whilst a loss could see that same side sliding rather uncomfortably back down to not-too-far above the relegation zone. Torino, as things stand, are in the very middle of that middle pack, meaning that every single game – and more importantly, every single point – earned could prove decisive in terms of where they find themselves standing at the conclusion of this campaign. Cagliari, meanwhile, have lost just one of their last five games and, although they are five points away from the drop zone, the Sardinians will nonetheless be hoping that their solid home record will bail them out here. Overall, the Rossoblu have done quite well at their temporary home ground, where they are unbeaten in their last six games. In fact, no team has beaten Cagliari at their home ground this season – so Torino would be looking to become the first time to leave the Sardegna Arena with all three points in hand. This could be tricky perhaps, especially considering that so far, Cagliari’s sole loss in their last five games was against Juventus – which is hardly a shock considering that no one has beaten the reigning Scudetto champions this season. That being said, although this is a somewhat fairly balanced fixture when it comes to head-to-head, with 19 wins for Cagliari versus Torino’s 24 (and 19 draws) it’s the Granata who come out on top when one looks at their more recent meetings. Torino are unbeaten in their last seven meetings with Cagliari (W6 D1). The last time the Rossoblu beat the Granata was on November 10, 2013.